You know what? You are an amazing person! You are thinking of buying your loved one, family member, friend, enemy or even your mother-in-law a skydive! Whoever it is, they’ll be sure to have the experience of a lifetime. Skydive Robertson has been running for 46 years years since it was formed in 1972. We are small but friendly skydiving dropzone situated at Robertson Airfield, east of the picturesque and historic town of Robertson. 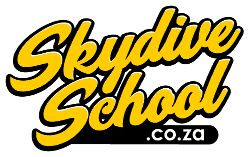 We provide the best skydiving experiences in the Western Cape. Currently you can only request a certificate for a place on our First Time Jump (FTJ) course as we are unable to offer tandems at this time. One thing we need to make clear now, you DO NOT need do a tandem skydive before attending our First Time Jump (FTJ) course. And to make sure that is clear so I’ll say it again in another way; many skydivers have NEVER done a tandem skydive, they just turn up and learn how to jump. And many keep coming back and keep jumping. Learning to skydive gives somebody a huge boost because they overcome lots of fears about height and their perception of risk, and it provides them with a way to gain more personal confidence. Yes, a tandem skydive does the same thing, but nowhere near to the same degree as jumping out of a plane on your own. Would you believe that regular jumpers skydive to relax? Check out the The Health Benefits of Skydiving. To get a gift certificate for our First Time Jump (FTJ) course just fill out the form below. When we’ve received your gift certificate request we’ll reply based on your choices below and send you the total amount of the booking. There is no need to give us a date now, but we’ll need you to book prior to your recipient turning up at the dropzone by emailing bookings@skydive.co.za or sending us a WhatsApp. We’ll send you a PDF version for you to print if you want to, but please think about saving trees.